Black Galaxy Granite also known as Star Galaxy Granite is naturally endowed with all the properties of granite stone that are essential for the layouts like durability, scratch free, moisture resistant and Low maintenance. 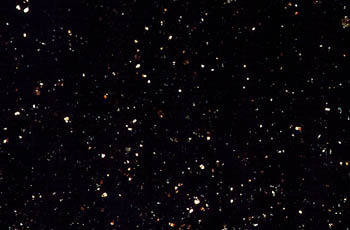 Black Galaxy is dark colored granite with golden specks and appears as Night sky glittering with Golden Stars all over the surface because of which it is not only used for residential purposes but for commercial projects as well. Black Galaxy Granite tiles or slabs are widely used for flooring, table tops, countertops, cladding and various other purposes. We at Associated Natural Stones (ANSI India) bring to you the love of nature & inspire you to create one of its kind totally unique environments which no one can ever duplicate along with bringing unparalleled beauty, permanence & a style statement. ANSI India's range of products such as tiles, slabs, veneers, borders, wall claddings, mosaics are ideal for floors, walls, countertops, patios, swimming pool surrounds, copings, steps, landscaping, paving's, roofs, walkways & garden i.e. no one can match it exactly as is indifferent to the fact that you use a slate, granite, marble, sandstone or any other form of natural stone. We at ANSI India bring to you the love of nature & inspire you to create one of its kind totally unique environments which no one can ever duplicate along with bringing unparalleled beauty, permanence & a style statement. ANSI India's range of products such as tiles, slabs, veneers, borders, wall claddings, mosaics are ideal for floors, walls, countertops, patios, swimming pool surrounds, copings, steps, landscaping, paving's, roofs, walkways & garden.we export granite & granite rough block and marble to various parts all over the world including the united states, europe, australia, africa and middle east. Besides being a manufacturer, exporter, supplier and trader of unmatched repute, we have also spread our business activities as an importer sourcing a range of high quality granite, marble, porcelain file, wooden furniture, food products, etc. From overseas suppliers. Thus, we, at blue mount exports, strive to offer you a one-stop solution to your varied needs- all at an affordable price. We are a 100% export oriented company importing approximately 10% of our total products. We specialize in rough granite slab, granite slab, vanity top, kitchen top and monument, and welcome every opportunity to serve you in a way far better than our competitors can do.